People who love traveling to new wineries now have added incentive to visit the vineyards of Cherokee and Clay counties. Nearly 700 square miles there and in north Georgia have been designated the Upper Hiwassee Highlands American Viticultural Area. AVAs are federally recognized regions that showcase an area’s distinct wine-making attributes. North Carolina’s fourth AVA—and Georgia’s first—lies within the natural geographic boundaries of the Hiwassee River watershed. The rolling terrain is excellent for grape-growing, despite the challenges of often wet summers, bone-chilling winters, and early spring frosts. AVA designation by the Alcohol and Tobacco Tax and Trade Bureau allows vintners to describe the origin of their wines and helps buyers understand where wines come from. There are just over 200 AVAs in the United States, including well-known ones like California’s Napa and Sonoma valleys. 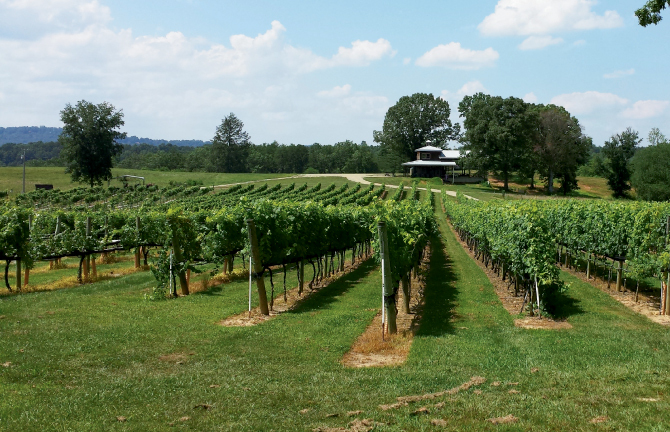 Certification is a game-changer for Cherokee and Clay counties’ vineyards and wineries. “The AVA [designation] puts us on the map, literally and figuratively,” Carlson says, predicting more wineries will open as a result. Already, the commercial vineyards in the AVA grow about 54 acres of grapes, and they plan to plant another 76 acres within five years.